Need to light up a room? Put on this dress with 24,000 LED lights! – ¿¡ tjongolongo ?! I actually came across this dress a while back and it made me go tjongolongo immediately, but I never got around to write about it till now. The Galaxy Dress, as it’s called, contains 24,000 LED lights and 4,000 Swarovski crystals which have been embroidered on the dress. The makers of the dress, CuteCircuit, say that it is the largest wearable display in the world. If you like this kind of stuff I really recommend you check out their site, they’ve got more interesting projects like the kenetic dress. The dress that changes depending on the mood you’re in! Check out the dress in action! Tjongolongo, I really think this is an amazing piece of art. I wonder if anyone will ever wear this though. If I were in the clothing business I would use this piece to inspire my next winter/Christmas themed window display. You can do some freaky things with light! 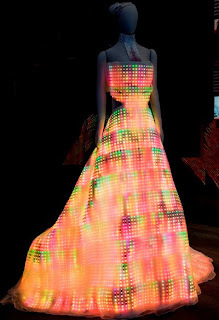 Would you wear a dress or perhaps a suit filled with LED lights?